Mohill GAA Club and the wider community is in mourning after the sudden passing of Mary Kennedy after a long illness last Sunday morning. 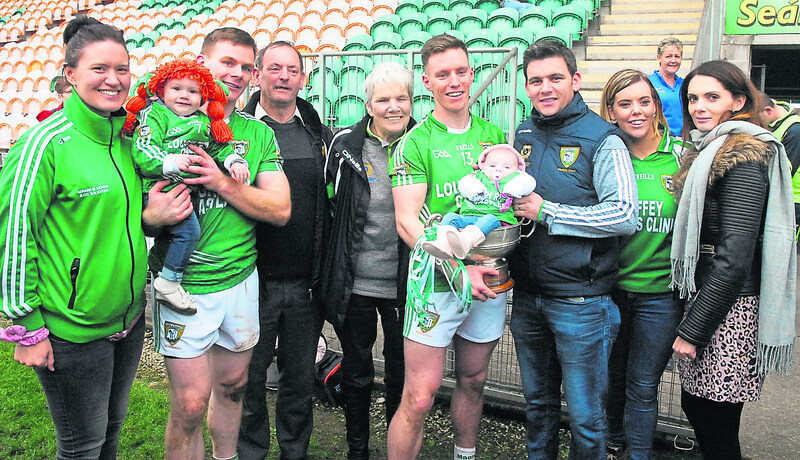 Described in a tribute in this week’s Mohill GAA Club notes as “the beating heart of this club”, Mary became the face of Mohill’s 2017 Leitrim Senior Championship win after captain Danny Beck gave her the honour of lifting the Fenagh Cup last October. Mary, who passed away on Sunday, June 24, in University Hospital in Galway after a long illness, was known the length and breadth of Leitrim and immersed herself in Mohill GAA Club. Sons Ronan and Ciaran have both played for the Leitrim Senior team while eldest son Sean managed the Leitrim County Minor team and her daughter Roisin is heavily involved in Scor in the Mohill club. Her husband John was a well-known businessman in the Mohill area while Mary herself worked as administration staff in Carrick-on-Shannon Garda Station. In a heartwarming tribute, Mohill GAA club notes wrote “She was a trusted officer for many years and over the decades washed and patched thousands of jerseys. Mary was a feeder! Mohill would hardly have won our last few County titles without her unending supply of sandwiches and her large pots of pasta that would put any Italian mother to shame. When asked about asking Mary to lift the Fenagh Cup last October, Mohill captain Danny Beck said “Delighted for Mary Kennedy there, she took sick during the year and she never misses anything, she is at every training session there, she is making sandwiches for us, she is wishing us well. Mary is survived by her husband John, children Sean, Ciaran, Ronan and Roisin, brother Padraic (Longford), grandchildren, mother-in-law, sisters-in-law, brothers-in-law, daughters-in-law, niece, nephews cousins, extended family, relatives, neighbours and friends..
Mary’s remains will be reposing at the family residence today (Monday, June 25) from 6 to 10 pm and again on Tuesday from 12 noon to 3 pm with removal to St. Patrick's Church Mohill at 7 pm. Mass of the Resurrection on Wednesday at 11.00am with interment afterwards in the local cemetery. Family flowers only please, donations in lieu, if desired to SHOUT (Sligo Hospital Oncology Unit Trust) c/o Early's Funeral Directors. The staff of the Leitrim Observer offer our deepest sympathy to the Kennedy family on the passing of Mary. May Mary Rest In Peace.